Available in black or titanium with or without Prisma and in-built DAC, this integrated amp offers versatile performance options and has an impressive power system. Primare I35 Integrated Amplifier with optional Prisma replaces the earlier I32 model and, if you so choose, includes a built-in DAC and/or the brand's Prisma capability. The I35 is the first to utilise the new UFPD 2 power system which is a noteworthy update of Primare’s award-winning UFPD all-analogue Class-D technology, so you can be assured that this model offers a high-calibre performance. The I35 is available in a choice of black and titanium so will make a sophisticated addition to your existing set-up. The I35 delivers 150 watts at 8 ohms, therefore showcasing fully balanced analogue input options. 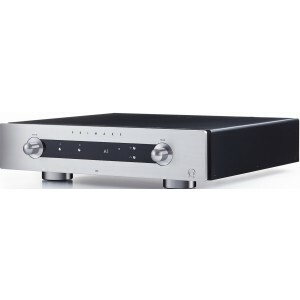 The model also includes a full-featured DAC stage enabling PCM 768kHz and DSD 128 conversion, as well as Prisma connectivity and control technology. Prisma is Primaire's bespoke network playback service that allows you to access stored and streamed media via a Wi-Fi or Bluetooth connection, all controlled through Prisma's specialised app. This means that you can manage Prisma anywhere from a mobile device, which is truly liberating.